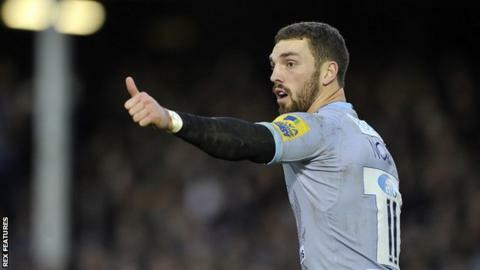 Northampton Saints and Wales wing George North says he is "over" the concussion problems of last season. North, 23, suffered four head blows in five months, the final one keeping him out between 27 March and 29 August. "From my point of view that's behind me now, I'm over it," said North. "Initially it was a bit worrying, everyone saying that's my career finished. My first game was Ireland away for Wales - as soon as the final whistle went I was happy to be back." Speaking to BBC Radio Northampton, he added: "I'm feeling pretty good now. It's just nice to be back playing and not to be worrying about my head too much." North, capped 55 times by Wales, signed a new contract to keep him at Franklin's Gardens beyond the summer, when his previous deal expired. He has yet to register a try for his club this season, with Saints having recovered from a poor start to climb to fifth in the Premiership and sit second in their European Champions Cup group. "It's a bit frustrating [not scoring] but something I'm not really worried about. "Being how tough it was with Wales and going back to a different way of playing and re-learn everything, it's been tough to find my feet. "The form of the club hasn't been particularly good, but they're performing well at the moment and hopefully we'll both start playing well together. "